Health: What Is It Worth? 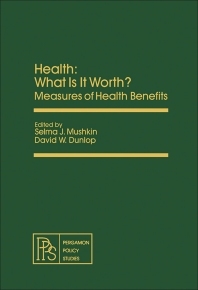 : Measures of Health Benefits is a collection of papers that tackles concerns in health care services and health benefit systems. The title first deals with the measure of health status, along with the policy that governs it and the results of contemporary biomedical research. The text also covers the approaches for the assessment of long-term care. The next part talks about valuing health and health benefits. Next, the selection deals with a method for the computation of the social rate of returns derived from investments in biomedical research. The last part discusses the concerns in health resource allocation. The book will be of great interest to the legislative bodies of governments, health officials, and health professionals.